We appreciate that it takes much more than an office to make a business successful. That’s why we offer a comprehensive range of specialised office and administrative support services to create a one-stop business solution. All services are fully tailored to your needs, and nothing is too big or small that our dedicated team can’t help you. When you lease a serviced or virtual office in Manama with PRIME, our professional and dedicated staff are always on hand to support you. Whatever business presence you’re looking to establish, we have all the services and support you require. Our professional knowhow will also ensure that starting a new company in Bahrain is as straightforward as possible (our offices each have an individual municipal number, which helps with registering your company in Bahrain). And for established businesses, you can be sure that we will get the job done to a high standard every time, delivering the flexibility, value and efficiency your business demands. Other services to suit your needs are also available – just ask us for details. Legalisation (or Attestation as it is commonly known) is the process of authenticating a document to the required level so that another country will be happy to accept them as genuine. Notorisation is the attestation, by a Notary Public, of the authenticity of a signature on a document. PRIME can arrange such attestations with the Ministry of Commerce and Industry (MOIC), the Bahrain Chamber of Commerce and Industry (BCCI), Ministry of Foreign Affairs, embassies and other ministries such as the Ministry of Health, the Ministry of Education and so on. 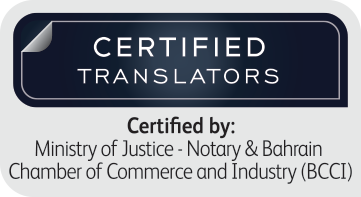 We can also arrange notorisations with the Notary Public’s office. We are also excited to announce the appointment of PRIME’s very own Partner, Mr. Hatim Q. Zu’bi (also a Partner at Zu’bi & Partners, Attorney’s and Legal Consultants), as a Notary Public permitted to provide Private Notarial services (English Language) by the Bahrain Ministry of Justice & Islamic Affairs pursuant to Ministerial Order (23) of 2018 with Respect to the Appointment of Private Notaries. A full list of the documents he is able to notarize in the English Language, pursuant to Ministerial Order (78) of 2017, is listed in the attached Order. Everything from basic bookkeeping through to preparation of audited financial statements and annual submission to the Ministry of Industry & Commerce. We can help fast track registration procedures for company commercial registration (CR). We can also assist with renewal, which must be done on an annual basis. Plus, you may need additional sector-specific licences, which we can help with as well. This covers everything from legal advice on start-ups and new company registration through to business closure (liquidation). Services include share transfer, organising trustees and nominees, and corporate securities. This covers all aspects of ensuring that your company is compliant with the Ministry of Industry and Commerce regulations and includes services such as the holding of the company’s statutory records, maintaining the shareholders register, convening the Annual General Meeting of the company if required and the filing of the audited financial statements. Efficient and secure IT is vital to any business, but particularly one operating internationally. We can help you set up, maintain and secure your systems, accessing all the hardware, software and support services you require. Our support includes access to offices and meeting rooms of all types and sizes, for anything from a few hours to many months or even years. Further specialist services available include videoconferencing, teleconferencing and secretarial support. We can handle both payroll processing and payroll accounting, ensuring local and international staff are paid promptly, securely and efficiently, while ensuring compliance in areas such as tax and insurance. Visa processing assistance, including LMRA registration, residency permits and Bahrain visas. For any or all of these areas of business support, the PRIME team can help. For further details please contact us.